New York magazine is all a flutter over the emergence of a poutine in gotham city. Seriously? Poutine has become the meal/snack of Manhattan trendoids?! It's DISGUSTING!! Blobby cheese curds trapped in goopy tepid gravy suffocating poor french fries?! It's the most vile "edible" creation to ever see the light of day. Even us Canucks are on the fence (for the most part) about this nasty, puke-inspiring dish. Spare me. 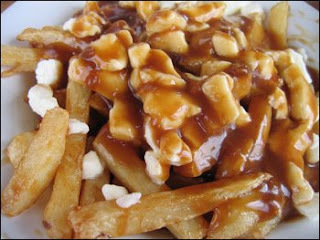 If poutine establishments in NYC mean the concoction will be less visible here in Canada, I'm all for it. You don't like Poutine? Gasp!! Unfortuntely, I love the stuff! Myrna, you're welcome to it! I just can't go there!